In the New York Times bestselling autobiography Rogue Warrior, Richard Marcinko chronicled his controversial career in the U.S. Navy's elite maritime commandos, the SEAL teams. After his success as creator and commander of the counterterrorist SEAL TEAM SIX, he was ordered to create Red Cell -- a dirty-dozen team of SEALs whose mission was to infiltrate the Navy's most secure installations. Marcinko did his job too well. His reward was a year in a federal penitentiary. During that year, Marcinko and John Weisman wrote Rogue Warrior...but government restrictions meant Marcinko could only tell a fraction of his incredible story. Now the secrets he could not reveal explode on the page as the Rogue Warrior returns in the blockbuster suspense novel of the year -- a novel with him as the hero! 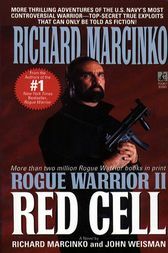 As ROGUE WARRIOR II: RED CELL begins, Marcinko, now a freelance security expert, makes a shocking discovery: smugglers are transferring nuclear materials to North Korea through Japan -- with backing from traitorous Americans. Recalled involuntarily to command RED CELL and stop the operation, the Rogue Warrior, with his loyal SEALs, will do anything to crush those who would betray America for a price. Based on current SEAL tactics, ROGUE WARRIOR II: RED CELL is an electrifying, sure-fire hit.